An infant must be properly restrained in a rear-facing, reclining child seat until the infant reaches the seat maker’s weight or height limit for the seat, and the infant is at least one year old. When properly installed, a rear-facing child seat may prevent the driver or a front passenger from moving their seat all the way back, or from locking their seat-back in the desired position. It can also interfere with proper operation of the passenger’s advanced front airbag system. If this occurs, we recommend that you install the child seat directly behind the front passenger’s seat, move the seat as far forward as needed, and leave it unoccupied. Or, you may wish to get a smaller rear-facing child seat. Placing a rear-facing child seat in the front seat can result in serious injury or death during a crash. Always place a rear-facing child seat in the rear seat, not the front. 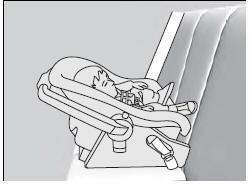 Rear-facing child seats should never be installed in a forward facing position. Always refer to the child seat manufacturer’s instructions before installation.